In the same way that most music artists are seemingly contractually bound to release a Xmas album (or at the least, a single), the same appears to apply to actors as well. This is the only way to explain the existence of Pottersville, a movie that features a well-known and very capable cast literally going through the motions right before our eyes. 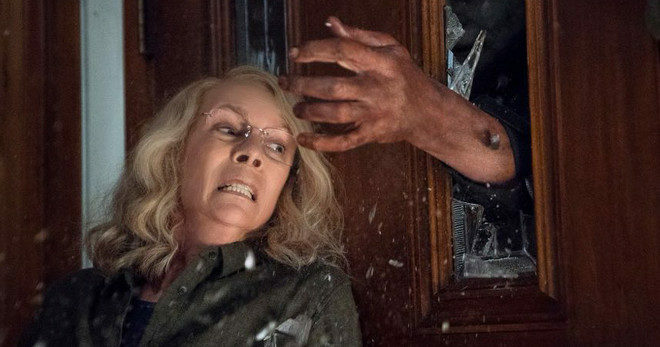 It’s a movie that will encourage viewers to have one too many glasses of Xmas punch, or perhaps wish they could choke on a mince pie while they’re watching it. It’s not even so bad it’s good; in fact, it’s just plain awful. So what on earth could have attracted said cast to the project in the first place? And why did two of them jump on board as producers? (Perlman is a co-producer, while Shannon is one of several executive producers – along with Patricia Hearst, which is still a weird notion even after all this time.) Surely they had some degree of confidence in the script, some idea that this could be a traditional heart-warming tale for children and adults alike? Didn’t they? 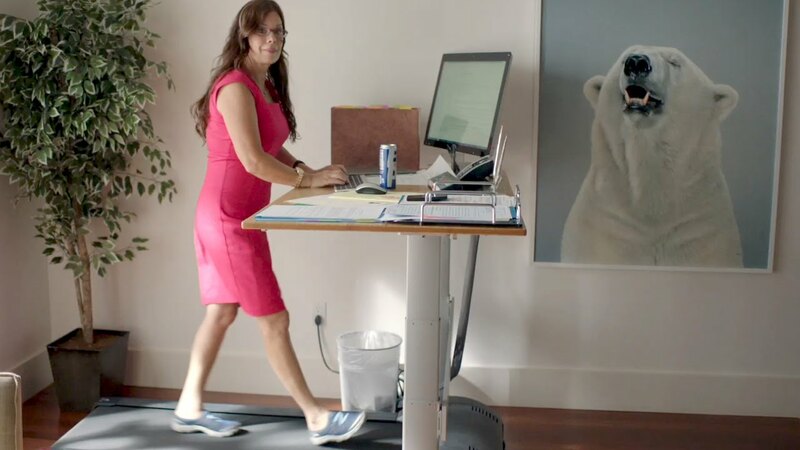 Well, if they didn’t, then the final product – directed by relative newbie Henrikson from a script by feature debut screenwriter, Daniel Meyer – must have come as quite a surprise. For while this looks very much like a Xmas movie at first glance, and while there’s plenty of snow around, and the wintry feel lends itself to being a Xmas movie, Pottersville isn’t set at Xmas, there aren’t any Xmas trees or decorations in sight, no one dresses up as Santa, and nobody has a tragic Xmas tale to tell a la Gremlins (1984). It’s all so misleading, especially when the poster supports the idea that this is a Xmas movie, and features various Xmas trees and twinkly lights (and as for Lennon sporting Santa’s headgear, let’s not even go there). But while this isn’t a Xmas movie per se, it’s certainly feeding off the hope that viewers will begin watching it as such and wll be sucked in by the movie’s snowy mise en scene, but by the time they work out that they’ve been duped, the audience will have been exposed for too long to the movie’s daft sensibilities and ham-fisted attempts at providing the kind of generous helpings of down-home folksy wisdom that would make a reindeer choke and Santa blush with embarrassment. When it’s not being a Xmas movie – which is still all the way through – Pottersville is content to disturb the spirit of Xmas Past and rehash key elements from a proper Xmas movie: It’s a Wonderful Life (1946). Alas, it’s a telling distinction, as Shannon’s main character, general store owner Maynard Greiger, is no George Bailey, and despite Shannon’s obvious skill as an actor, here he’s no James Stewart either. Financial matters, though, are to the fore as the struggling town of Pottersville faces an uncertain future thanks to an economic downturn. There are more stores that are closed than open, and Maynard is the kind of philanthropic individual who’ll happily let someone off their bill if they’re having difficulty finding the money. With only one employee, Parker (Greer), it’s hard to work out how he’s managed to stay open, but he seems happy enough (if a little resigned to following in the foreclosed footsteps of his main street neighbours). A chance discovery that his wife is a Furry, and that his long-time friend and town sheriff, Jack (Perlman) is too, leads Maynard to get drunk and put on a Sasquatch outfit in a moment of alcoholic “insight”. He roams the town at night, is seen by too many short-sighted townsfolk, and soon discovers that his drunken behaviour has led to everyone believing that Bigfoot is alive and well and living in the woods outside of town. With “Bigfoot” attracting media attention, Pottersville is soon inundated with people hoping to catch sight of the hairy fella, and the residents are only too happy to help relieve said people of their money, offering Bigfoot related merchandise and the like. Maynard sees the turnaround in the town’s fortunes and decides to keep quiet about what he did, and even provide the odd extra sighting from time to time. But there’s a fly in the ointment, in the shape of reality TV presenter, Brock Masterson (Lennon). Masterson arrives in town with his Australian accent and bored entourage, and promises to catch Bigfoot live on his show, Monster Finder. His initial attempts though, are unsuccessful – surprise, surprise – but when he accepts the help of local tracker and hunter, Bart (McShane), Maynard’s secret is placed in jeopardy, and so is the town’s renaissance. While there are some occasional moments when it seems as if the movie is going to break free of the heavy chains created out of Meyer’s poorly constructed (and hopelessly contrived) script, and Henrikson’s laboured direction, the movie shuts those moments down with a crash and its business as usual. 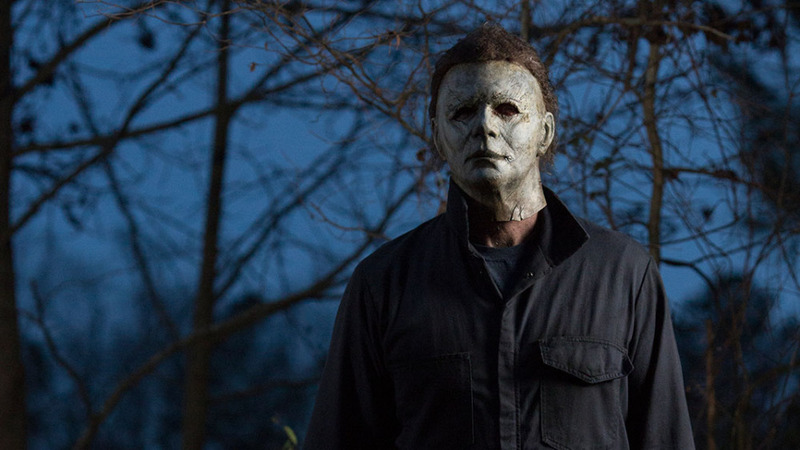 There is a kind of perverse enjoyment to be had from watching such a bad movie, but the feeling rarely lasts for more than a minute, and the cast don’t seem able (or willing) to fight their way out from under. Shannon is under-used and left to look thoughtful for much of the movie, while Lennon portrays Masterson like a twelve-year-old going through atomoxetine withdrawal. 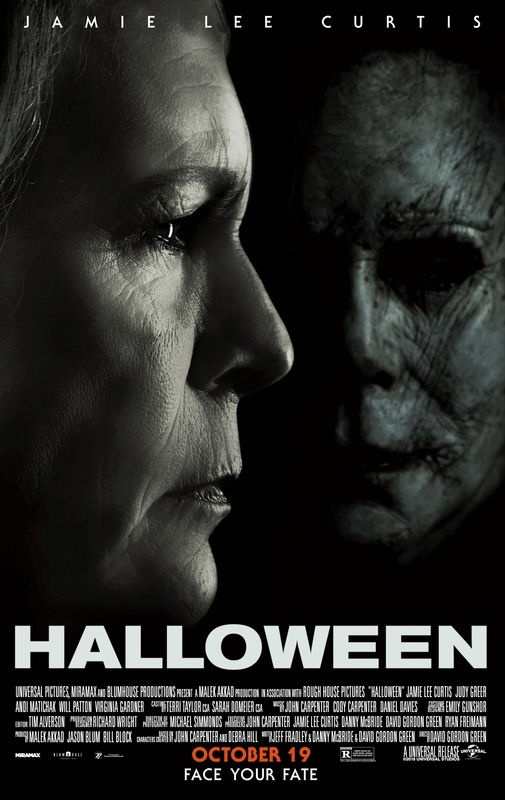 Perlman and Greer fulfill their contractual obligations, Hendricks gets to spend a fair bit of time in a bunny costume, and McShane is perhaps the most “game” of all, but even he’s struggling, and when someone with McShane’s talent can be seen to be struggling, then it’s all you need to know. 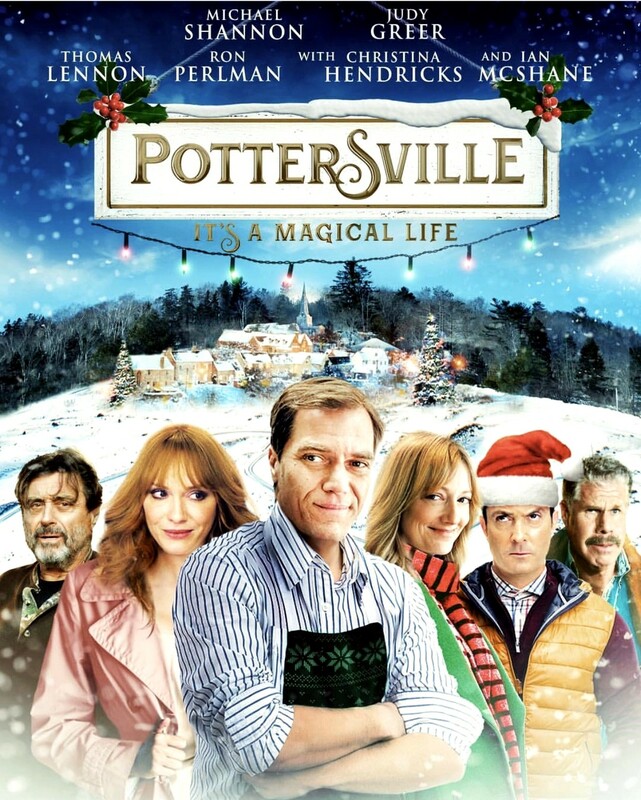 Rating: 3/10 – like an evil Xmas present left out for the one kid on Santa’s Naughty List, Pottersville is appalling yet brief, far-fetched to the point of infinity, and not really worth anyone’s time – even fans of the cast; such a conspicuous waste of time and effort isn’t seen very often, and this is one of those occasions when it seems only WTF? will do as a response, but beware: you’ll be saying WTF? so many times it’ll be exhausting. 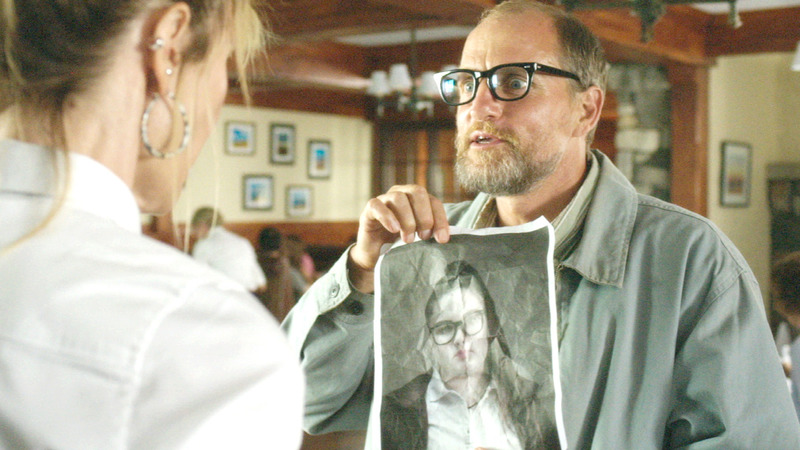 Wilson (Harrelson) is a loner with a strong misanthropic streak. He’s dissatisfied by most aspects of modern day living, and feels that communication isn’t what it used to be, that people are too insular. In an effort to combat this he’ll often approach people that are on their own, and try to strike up a conversation with them (and to their obvious consternation and confusion). In the wake of his father’s death, Wilson gets in contact with his estranged wife, Pippi (Dern), and against her better judgment they take the first steps towards being a couple again. During this time, Pippi tells Wilson something that gives his life a renewed purpose: he has a daughter somewhere. Wilson soon tracks her down. Her name is Claire (Amara), she’s seventeen-years-old, and she’s a little overwhelmed when Wilson and Pippi suddenly turn up out of the blue. They try to spend time with Claire, but it’s difficult as they want to keep Claire’s adoptive parents in the dark about it all. Eventually the three of them embark on a trip to visit Pippi’s sister, Polly (Hines), and her family. The visit doesn’t go so well, and Polly works out that Claire’s parents don’t know where she is. The police are called, and Wilson is arrested on a charge of kidnapping. He winds up in prison for nearly three years. When he gets out, he finds that people are still as insular as ever, and that his life is about to take a turn for the better – probably. 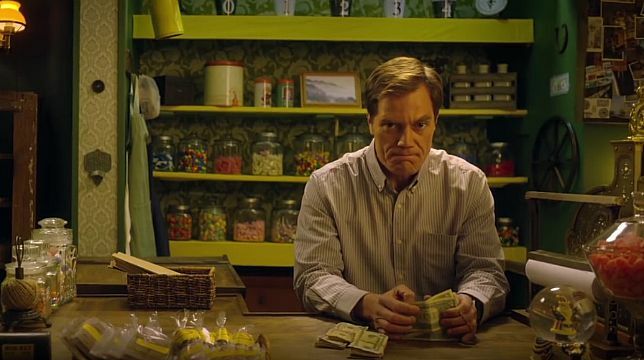 Adapted by Daniel Clowes from his own graphic novel of the same name, Wilson was meant to be director Alexander Payne’s next project after Nebraska (2013), and with that knowledge in mind it’s tempting to wonder what the movie would have been like if he’d stayed on board. 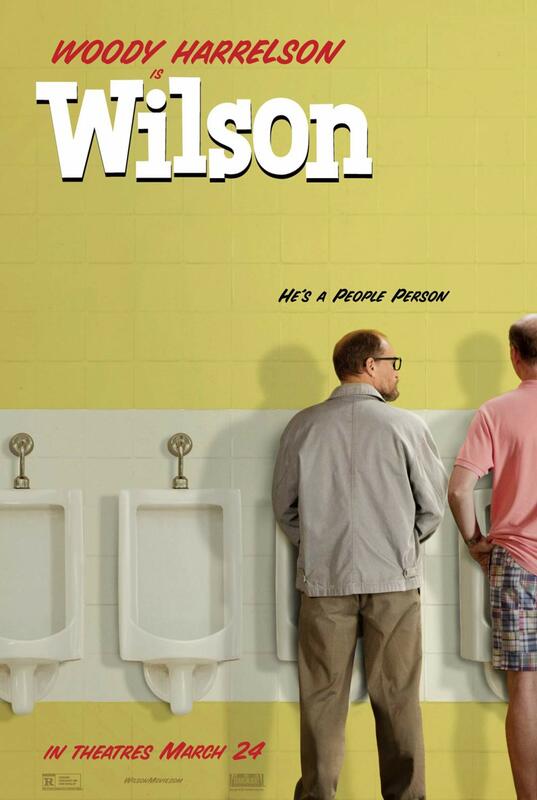 It’s not that Wilson is a bad movie, but it is one that can’t quite decide whether it wants to be a relationship drama, a bittersweet comedy, or something else entirely. What it is in the end, is a movie that flits back and forth between drama and comedy, and in the process fails to do adequate justice to either of them. The drama lies somewhere in the relationship between Wilson and Pippi, and the longer we see them together the easier it is to understand why she left him in the first place. Wilson bemoans how little people communicate, but doesn’t understand that the way he does it, it isn’t always appropriate. The comedy is almost exclusively laid at the feet of Wilson himself, with said inappropriate behaviour causing all sorts of (mostly humorous) problems. But sometimes he sounds as if he’s being belligerent instead of caustic, as if between them Clowes and director Johnson have lost something of the character’s tone in translation. Harrelson gives a good performance, offering an interpretation of Wilson that ranges from manic to brash to insensitive to contemplative and all the way back to manic. Dern is also good as Pippi, a woman with “a past” that she’s trying to overcome. There are hints that Pippi has an addictive personality, and Dern reveals this added layer to good effect throughout. But the movie as a whole doesn’t make Wilson as sympathetic a character as it needs to, and the fallout from this is that Wilson the movie becomes an exercise in watching boorish behaviour being rewarded through a series of unlikely reversals and setbacks. Rating: 6/10 – a mixed bag approach to the material – much of it lifted wholesale from Clowes’ graphic novel – means the narrative plods along in places and gives Wilson a patchwork feel that it never overcomes; the kind of movie that may well find itself ripe for reappraisal in ten years’ time, right now it’s an unconvincing look at one man’s studied ignorance of others, and his inability to recognise his own shortcomings. Elle Reid (Tomlin) is a once well-known poet. She’s also a lesbian whose long-term partner has recently passed away. She has a daughter, Judy (Harden), she isn’t on very good terms with. She’s grouchy, antagonistic and caustic as the mood takes her. She’s also just shown the door – horribly – to Olivia (Greer) whom she’s been in a relationship with for four months. And now she’s visited by her granddaughter Sage (Garner) who’s pregnant and needs $630 for an abortion by five forty-five that evening. No wonder she’s so unapologetically cranky. Elle has another reason to be in a bad mood: thanks to an attack of principles she’s cut up her credit card and used it as a wind chime, so she can’t give Sage the money she needs. To make up for this selfish crime against modern day living, Elle agrees to help Sage find the money from other sources. First they visit Sage’s boyfriend, Cam (Wolff), where his aggressive and disrespectful attitude to Elle leads to some unexpected violence and the accrual of $50. From there they try to call in a loan from one of Elle’s friends, Deathy (Cox), but that only nets $65. When Elle next tries to sell some of her first edition books (even though they’re not in the best of condition), that plan backfires when Olivia appears on the scene and an argument ensues. With time running out, Elle decides she has to take a risk and visit an old flame, Karl (Elliott). At first Karl seems amenable to lending Elle the remaining $515 but their shared history ruins things and he refuses. This leaves Elle and Sage with only one remaining option: they have to see Judy and ask for her help, even though she and Elle are effectively estranged and she has no idea that Sage is pregnant (Elle also tells Sage that she’s afraid of Judy and has been since she was five). 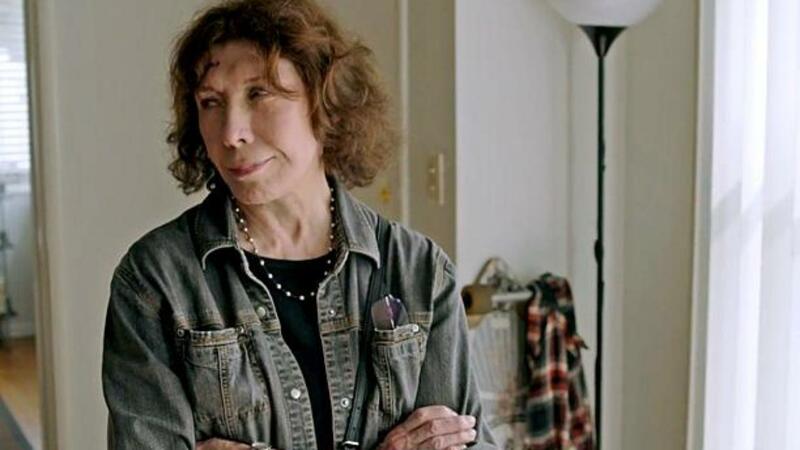 It should take the viewer roughly two minutes of Grandma‘s running time to see why Lily Tomlin signed up to play Elle. In keeping with her literary background, and doing her best to end her relationship with Olivia as quickly as possible, Elle refers to her as “a footnote”. It’s an unnecessarily cruel remark, and Tomlin delivers it casually, as if it were of no more significance than if Elle had called Olivia a terrible lay, or a boring conversationalist. And from that nasty remark, and Elle’s adamant refusal to apologise, the viewer can see that spending time with Elle is going to be made all the more enjoyable thanks to Tomlin’s acid dry performance. Yes, she’s unconscionably horrid at times, and yes she does her best to belittle the people she despises (which seems to be everyone outside of Sage and Deathy), but it’s Elle’s acerbic, take-no-prisoners attitude that is so ironically appealing, and Tomlin knows this. And knowing this she grabs the role in both hands and has a high old time with it. But Tomlin’s performance isn’t the whole movie, and thanks to Weitz’s command of his own script, Elle isn’t allowed to overwhelm the other characters, and she doesn’t get all the best moments. And it’s not just about one woman’s misanthropic attitude to the world around her, but the ruptured family dynamics that keep her alone following the death of her partner, and how her being needed leads to a reconciliation that everyone is a part of. This gives the movie the heart it needs to balance Elle’s angry behaviour, and leavens the nihilism she seems to revel in. Without it, Grandma would still be funny, absorbing even, but it wouldn’t be anywhere near as rewarding. 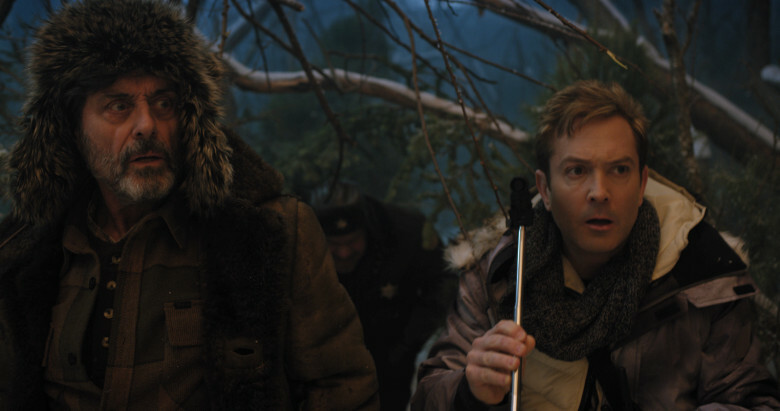 Weitz is back on form after a string of less than fully realised movies – Cirque du Freak: The Vampire’s Assistant (2009) and Little Fockers (2010) to name but two – and he creates a sympathetic storyline to hang his characters from, as well as making each encounter on the road to Judy’s office as grounded and credible as possible while also indulging Elle’s astringent nature. The outcome of the trip to see Karl is a particular highlight, adding a layer of unexpected poignancy to a situation that some viewers might not see coming until it’s there. It also gives Elliott the chance to show just how good an actor he is, and if Grandma has no other impact than to open the doors for Elliott to give further, equally moving performances then his appearance here will have been entirely worth it. By carefully balancing the inherent pathos and humour of Sage’s “situation”, Weitz also gets to poke fun at the American public’s antipathy to hearing the emotive word “abortion”. Elle and Sage are ejected from a coffee shop (that used to be a free clinic) thanks to Elle bemoaning out loud the clinic’s passing – “Where can you get a reasonably priced abortion in this town?” The word is used liberally throughout, and as an accurate description of the procedure Sage needs to have it’s entirely in context, but Weitz refuses to sugar coat the situation, and it’s to the movie’s credit that when Elle and Sage do encounter a pro-lifer (and her young daughter), their position isn’t criticised or lampooned, but instead is used to provide one of the movie’s best laughs. With Weitz so assured in the handling of the material, his cast are free to provide fully rounded characters that you can empathise with and support (except for Cam, naturally). Tomlin, as mentioned before, is on superb form, and is ably supported by Garner who gives Sage a wistful nature that makes it seem as if she’s always working things out in her head, but is just a little bit too slow in doing so (“Screw you”). Harden pitches up in the final third and does sterling work as the mother who can’t quite work out why her daughter is afraid to tell her she’s pregnant when she has such a distant relationship with her own mother. Greer has a handful of scenes as the jilted Olivia and displays the character’s dismay and pain at being rejected with aplomb, her need to know the real reason for her dismissal a necessary challenge to Elle’s self-centred arrogance. 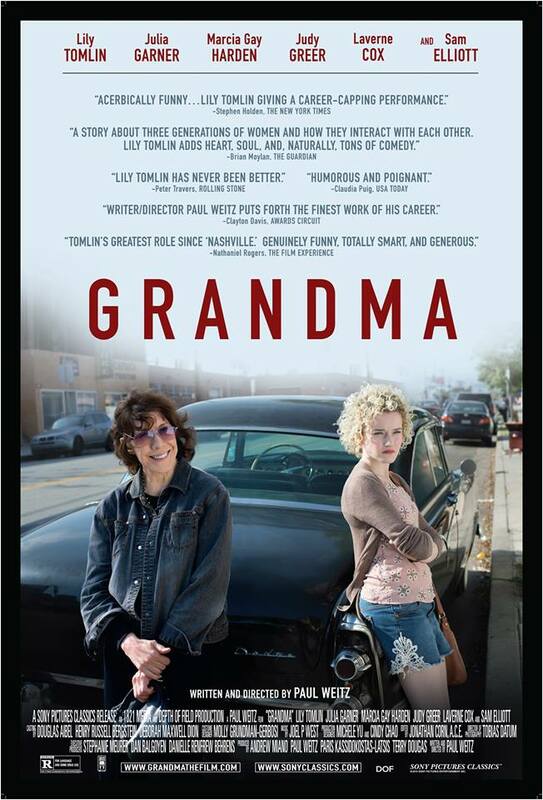 Grandma is a movie that it would be easy to overlook, sounding as it does like an indie chick-flick for the generationally unbiased. That it’s profoundly moving in places, riotously funny in others, and completely charming all the way through is more than enough to recommend it. It’s short, sweet, avoids a lot of the clichés associated with the subject of abortion, features a cast who are behind Weitz all the way, and is just plain terrific.